At the end of the show on the left is Grant Crandel, ASWA Vice President, with Michele Anna Jordan in the center and the ASWA President, Carl Brandhorst bring up the rear on the right. 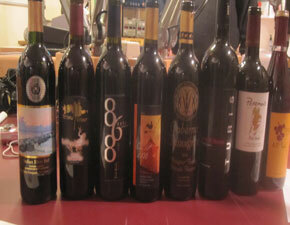 It was a very informative evening and Michele really enjoyed the wines. 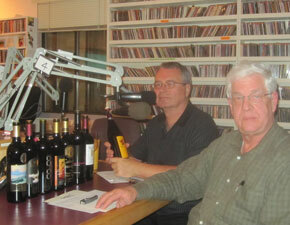 The Atlantic Seaboard Wine Association (ASWA) on the Michele Anna Jordan radio show in the studio. Grant Crandall, ASWA, Vice President on the left with the wines in the middle along with Michele Anna Jordan and Carl Brandhorst, ASWA President on the right. ASWA presented 8 (eight) wines for the evening and they are listed elsewhere on the web site, but shown on the table in center. No mention was made previously of one of the major workers to bring this evening’s ASWA presentation to the public. On the left is Ms. Anne Vercelli, the ASWA West Coast Rep who pulled all the logistics together for this evening’s presentation. ASWA Vice President, Grant Crandall is next with Michele Anna Jordan in the center with ASWA President, Carl Brandhorst on right. It would not have been possible without the advance work by Ms. Vercelli in this event to high light east coast wines. The Atlantic Seaboard Wine Association (ASWA) was invited again to be featured on the Michele Anna Jordan weekly radio talk show “Mouthful, The Wine Country’s Most Delicious Hour” on 31 January 2016. 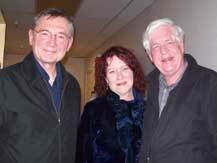 Ms. Jordan writes three columns on food and wine for the Santa Rosa Press Democrat newspaper. 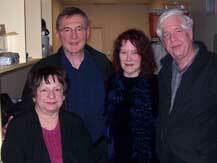 She is the author of three books on wine and food and was the food critic for the San Francisco Chronicle for 15 years. Her talk show was been on the air since 1995. All performances can be heard on PODCASTS at ITUNES or at www.krcb.org. The Association was represented by its President, Carl Brandhorst, its Vice President Grant Crandel and its West Coast Representative, Ms. Anne Vercelli of Healdsburg, CA. This was the fifth year the Association was on the show and this time, at Michele Anna Jordon’s request, ASWA highlighted eight award winning wines from the 10th annual wine competition. The competition highlights east coast wines from 17 states from Maine to Florida. The grapes must be grown and vinified within those 17 states in order to qualify for the competition. Michele Anna Jordan at the end of the show invited ASWA back next year (2017) with some of the competition’s winning wines from the 12th annual wine competition. 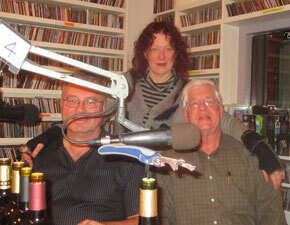 The Atlantic Seaboard Wine Association (ASWA) was invited again to be featured on the Michele Anna Jordan weekly radio talk show “Mouthful, The Wine Country’s Most Delicious Hour” on 2 February 2014. The Association was represented by its President, Carl Brandhorst, its Vice President David Barber and its West Coast Representative, Ms. Anne Vercelli of Healdsburg, CA. This was the fifth year the Association was on the show and this time, at Michele Anna Jordon’s request, ASWA highlighted eight award winning wines from the 9th annual wine competition. The competition highlights east coast wines from 17 states from Maine to Florida. The grapes must be grown and vinified within those 17 states in order to qualify for the competition. Michele Anna Jordan at the end of the show invited ASWA back next year (2015) with some of the competition’s winning wines from the 10th annual wine competition. 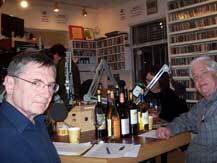 This evening on the 2nd of Feb 2014 the President of the Atlantic Seaboard Wine Association, Carl Brandhorst ( right) along with Vice President, David Barber ( left) are sitting in the studio of KRCB 91 FM radio station in Sonoma County for the Michele Anna Jordan talk show “Mouthful” to highlight wines from the recent ASWA wine competition held in July 2013. At the beginning of Michele Anna Jordan’s radio talk show “Mouthful”, Michele talks with the ASWA Team, Carl Brandhorst, President,and David Barber, Vice President along with the first wine from Nassau Valley,DE waiting to be opened. These are eight of the winning wines from the 9th Annual Atlantic Seaboard Wine Association wine competition held in July 2013 in Haymarket, VA. that were featured on the 2 Feb 2014 Michele Anna Jordan KRCB 91 FM radio talk show.